I'd like to put my social work education to work here for a minute and step up to advocate for the increased use of breakfast cereal in dessert recipes. These cookies are insanely good. The textural combination of the cornflakes, oatmeal, and lightly toasted, squishy marshmallows combined with the butterscotchy chocolate flavor was dangerously addictive. I especially felt that the cornflakes were the key ingredient here. I usually choose to make brownies, bars, or cupcakes before cookies, but these have leapt past any cupcake on my list. These cookies are based on a recipe that fellow Pacific Northwest food blogger Lorna Yee wrote as a recreation of the signature cookies from Momofuku Milk Bar. If you're looking for an interesting new twist on a basic chocolate chip cookie, take a chance on these guys. 1. Preheat the oven to 350 degrees. In a mixing bowl, beat together the butter, brown sugar, and granulated sugar until light and fluffy, about 2-3 minutes on medium speed. Add the eggs and vanilla extract, and beat until combined. 2. Add the flour, baking soda, and salt and beat on low speed, just so the dry ingredients become incorporated. With a wooden spoon, mix in the oatmeal, crushed cornflakes, and chocolate chips. 3. Scoop and roll the dough into golf ball-sized spheres, and place on a parchment or silpat-lined baking sheet. Six will fit comfortably on one pan; they will spread. Lightly press down 4 mini marshmallows in the center of each ball of dough. Sprinkle tops with a touch of salt. Repeat with the remaining dough. 4. Bake for 9-10 minutes. The cookies will still look soft in the middle when you take them out of the oven. Allow them to cool directly on the tray for a few minutes before moving onto a cooling rack to cool completely. fascinating! intriguing! appealing on every level! until now, i considered corn flakes to be a worthless breakfast cereal, but you've found a use in these suckers! the marshmallows are a wonderful addition too. excellent recipe, amy! This sounds wonderful. I have used cornflakes a couple of time in cookies and my friends loved them. Great recipe. yum! I def want to make these! They're SO good! I tried these a few weeks back, and could not stop eating them. At all. I feel like this is usually understood in most cookie recipes, but I think that with this recipe in particular it's important to insert for oneself the following line between steps 3 and 4: "and if you don't devour all of the dough immediately, proceed to step 4." Seriously, that cookie dough is good. Crazy good. Ditto Lauren and Anne. It's embarrassing how the more cookies I rolled, the more dramatically the projected number of cookies dwindled! Well, perhaps not embarrassing among friends. But kind of horrifying at the moment. Yes, people, these cookies are pretty phenomenal. I love the addition of corn flakes! What an interesting ingredient list. 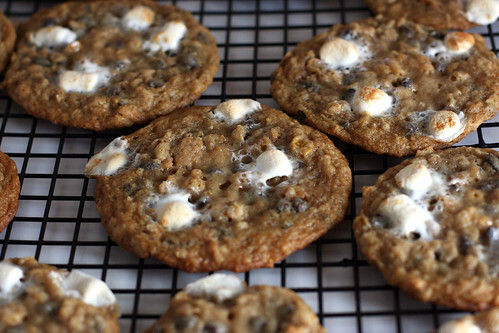 I love all sorts of cookies and bookmarked this right away to try later. Thanks! What type of oatmeal-Old-fashioned or quick cooking oats. Hi Jackie, I just used regular, plain old oatmeal. Hope that helps! Enjoy! OK, so I know this recipe was posted a long time ago now, but I just made these cookies yesterday and I think I may have done something wrong! They tasted awesome, but they came out very very thin & flat, like a lace cookie. Does anyone know if that's how they're supposed to be? I may have mis-measured the flour or leavening, it wouldn't be the first time. Just wondering how thin they came out for everyone else. Hi Shelly, thanks for stopping by! Sorry to hear that your cookies came out so thinly! You can sort of tell by the picture that mine were really thin as well. Others I've spoken with who have made this have reported similar results of varying degrees too. I'm glad to hear that they still tasted good, but I can't say I know enough about the science of baking to figure out what might make them not quite as thin.